With the passing of former president George H.W. Bush, America not only lost the last president who served in combat, but also the last of the “Greatest Generation” chief executives. The country has seen a string of Baby Boomer presidents since Bush left office, who, for whatever reason, avoided service in Vietnam. The only exception is President Barack Obama, who was too young to have served in the Vietnam War. President Bush’s recent passing signals the end of an era. Today, only 1 million out of 16 million World War II veterans remain alive. Photo courtesy the George H.W. Bush Presidential Library and Museum. Unrestricted Use. Soon, the Greatest Generation will pass into legend, remembered as the men and women who answered their nation’s call to fight tyranny and fascism on a truly global scale. They would then go on to create the post-war prosperity of the 1950s. But how did George H.W. Bush’s time spent fighting in WWII shape him as a leader? On December 7, 1941, George Bush was a student at Phillips Academy prep school in Andover, Massachusetts. 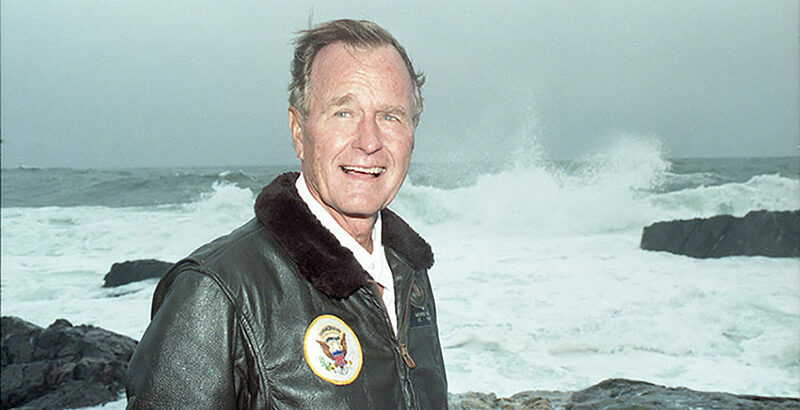 Upon hearing of Japan’s surprise attack at Pearl Harbor, Bush decided that he wanted to become a naval aviator. After graduating from Phillips Andover, he joined the Navy on his 18th birthday. Bush was commissioned in June 1943, just a few days before his 19th birthday. That made him one of the youngest naval aviators in history. In what was certainly his most memorable and life-changing experience of the war, Bush was the lone survivor of an ill-fated attack on a Japanese installation on Chichi Jima on September 2, 1944. He would lose both crew members when his plane was shot down. Forced to bail out after his aircraft engine suffered critical damage from intense enemy antiaircraft fire, Bush floated for four excruciating hours in his inflatable raft. Several American fighters circled overhead to provide protection. Finally, the USS Finback, a Gato-class submarine on lifeguard duty, surfaced to rescue the downed pilot. In a rare moment of historic serendipity, Bush’s rescue was captured on film by one of the sailors onboard the Finback. Bush served on the Finback for a month, participating in the rescue of other downed pilots. 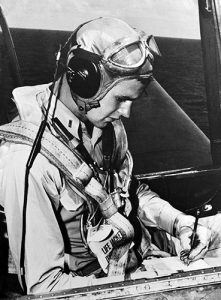 Bush flew 58 combat missions in all and received the Distinguished Flying Cross and three Air Medals. Later, he was reassigned to Norfolk, Virginia, to train new torpedo pilots. When Japan surrendered unconditionally in August 1945, Bush was honorably discharged a month later and entered Yale University. No doubt Bush’s leadership traits were forged in the furnace of the Pacific theater. As a coming-of-age trial, World War II would prove to be an entire generation’s defining moment. Historically, this seems to be a common theme. Those who serve in the military are less inclined to send others to war, while those who never served tend to be more hawkish. His wartime experience would also nurture a deep desire for lifelong learning and service. George H.W. Bush was arguably the best-prepared president ever to occupy the White House. He previously served as UN ambassador, CIA director, envoy to China and Vice President. 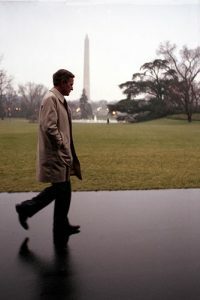 Although he served only a single four-year term as president, his Vice President Dan Quayle claims that Bush was “the greatest one-term president of all time.” He’s not wrong. 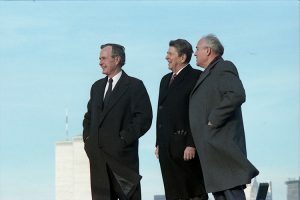 International relations were a hallmark of the Bush presidency. He led the country into the end of the Cold War and the reunification of Germany. Having experienced a truly global war, many now regard Bush as a man of conscience and reason, as well as a steady hand at a time of geopolitical instability. And so George Herbert Walker Bush passes into the history books, the last sentinel of the American Century. 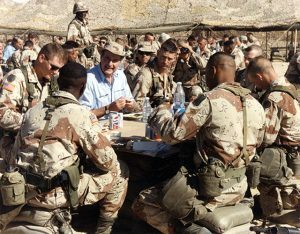 His decisiveness during and after the Gulf War, including his oft-criticized withdrawal from Iraq before a complete victory and the capture of Saddam Hussein, inspired me to join the military once I came of age. George H.W. Bush possessed personality traits that many of today’s political leaders are missing. It is heartbreaking that younger generations will never know the values that men such as Bush held dear. In today’s fast-paced information age, these traits are often mocked by political cynics and pundits as not reasonable, sane or shrewd. With the passing of Senator John McCain earlier this year, it’s tempting to despair and feel that bipartisanship is dead. But these traits didn’t die with Bush. They still echo in the halls of America’s military service academies and across U.S. military bases around the world. Words like integrity, service before self, character, humility, compassion and bipartisanship are alive and well in the profession of arms. There is real honor in volunteering to fight oppression. This week, America buries one of the most honorable men in any generation. One day before the 77th anniversary of the attack on Pearl Harbor, George H.W. Bush will be laid to rest at his Presidential Library in College Station, Texas, next to his wife Barbara and his late daughter Robin. Fair winds, Mr. President, and following seas. previous The U.S. Believes That Kidnapped Journalist Austin Tice Is Still Alive. Here Are 5 Things To Know About Global Kidnapping.